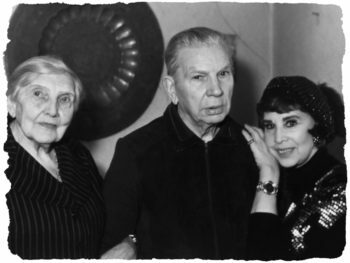 Riga, Latvia… November 1941 – Carolina Taitz and her family survived the first Aktion in the Riga ghetto in 1941. Jews were taken from the ghetto and killed in the Rumbuli forest. Soon the remaining families, including Carolina’s, were ordered to report for transport to a nearby concentration camp. The Taitz family quickly realized that they were being taken to the Rumbuli forest, the site of the first massacre. There was no way out. The Germans had just about reached the Taitz family when men on horseback arrived looking for seamstresses. Several Jews, including Carolina, her mother, and sister stepped aside. They were taken to the nearby prison and than back to the empty ghetto which was being filled with deported Jews from France, Belgium, and the Netherlands. Carolina decided she had to escape. She would try to find her old nursemaid and hide with her. She had already lost her father and brother in the massacre. She dressed as a man and left the ghetto with the work detail one morning. Once outside the ghetto, she removed the yellow star. She looked around for a place to hide and found a house with logs piled up for firewood. She hid between the logs and finally, got the courage to knock on the door. A man opened it and Carolina told him she had run away from the Riga ghetto and was trying to find her nursemaid. The man said, “Come in my child. Last night I had a vision. God came to me and said, ‘you will save someone who will come to you in need.”’ The man’s name was Vladimir Micko and the woman, his sister Olga Kateneva. The whole family, including Vladimir’s parents accepted Carolina. Vladimir dug a bunker beneath the floorboards. The hole was about 3 feet deep, 6 feet long and 6 feet wide. Since the Germans had built a garage on his property and were watching his activities, it was extremely difficult to dispose of the dirt he had dug out. It had to be carried out in small amounts hidden in specially made inner pockets in his clothing. Vladimir volunteered to take food to Carolina’s mother and sister in the ghetto. He went often into the ghetto, sewing on a yellow star in order to gain entry. The Nazis raided Vladimir’s home several times looking for Jews. They did not find Carolina. Carolina remained hidden in the home of the Micko family for three years, until liberation in 1944. Vladimir passed away in 1996. Olga passed away in 2001.